This amphibian, the Mastodonsaurus, is actually from the middle of the Triassic. I would argue that this is further proof of it’s awesome. It is just a shame I could have drawn it better. 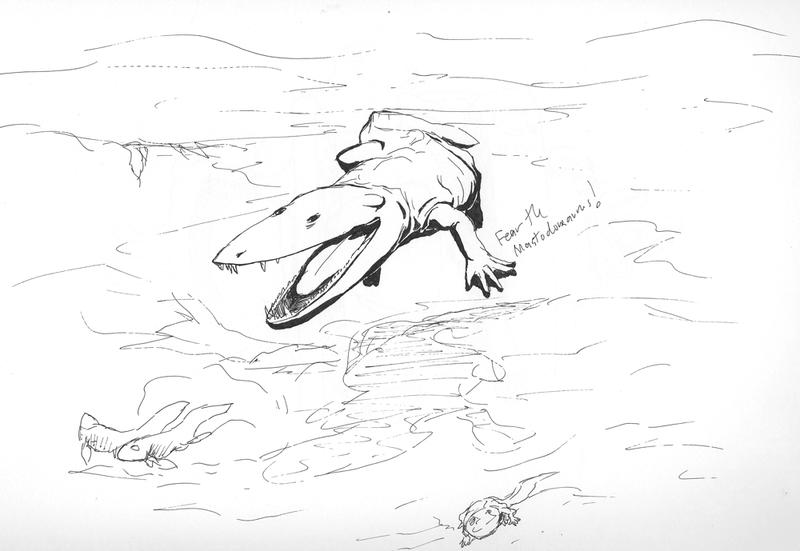 This entry was posted in Scanned Desksketch and tagged amphibian, extinct, triassic by Anthony. Bookmark the permalink. Do you do any science illustration? I have a friend in that field. This is clearly a quicker sketch, but you have way more knowledge of biology than me, for example. If you’re interested, check out her website at http://walkaboutem.com/. She’s the president of the California Guild for Science Illustrators. Thanks, her site looks cool. I have also responded to your email.